Molasses is the dense, viscous end product obtained after sugar cane and sugar beet has been processed into table sugar. The name is believed to be derived from the Latin word for honey, “mel”. There are different varieties of molasses, which come in an assortment of colors, flavors, and consistencies. 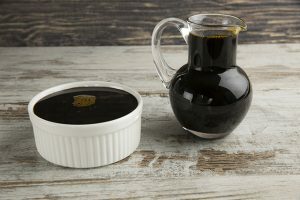 Molasses is widely produced in the United States, Brazil, Thailand, and the Philippines as a sweetener for food products; but its abundance of health benefits have also become more known in recent years. Molasses has a moderate amount of calcium, a mineral that has an important role in building and maintaining healthy bones and teeth. The presence of calcium and other nutrients like iron, selenium, and copper make this syrup rather efficient in keeping osteoporosis at bay. One cup of molasses is enough to provide over 141 percent of the recommended daily value of potassium. Along with magnesium and calcium, potassium ensures that the heartbeat remains steady, which in turn makes molasses an excellent food for a well-nourished heart. Molasses is a reliable source of iron, so menstruating women can use molasses to lessen their chances of iron deficiency. As with the heart, the calcium and magnesium content play important roles in caring for the uterine muscles. Blackstrap molasses has an ample supply of antioxidants, even more so than other natural sweeteners like honey and maple syrup. Consuming this variety of molasses can great minimize the risk of free radicals damaging the cells of the body. When the body lacks vitamin B6, headaches and fatigue can occur. Regularly consuming molasses can deliver vitamin B6 and can lessen the sensation of exhaustion. Molasses can be safely consumed by most people. However, people with digestive issues should be careful with it, while people who suffer from irritable bowel syndrome (IBS) should avoid it entirely. Ingesting large amounts of this syrup can cause digestive problems like diarrhea, those with sensitive digestive systems should exercise caution with molasses. There are three major varieties of molasses to watch out for: light, dark, and blackstrap. Light molasses is sweet and mild. Dark molasses is rich and is the one most commonly used in desserts. Blackstrap molasses is rather bitter and typically isn’t eaten by itself. Molasses promotes a healthy heart due to its high potassium content. Molasses is also a reliable source of iron. Blackstrap molasses contains a good amount of antioxidants. Molasses may alleviate symptoms of vitamin B6-deficiency. Those with digestive issues should be careful when consuming molasses.